I haven’t made focaccia for a very long time. This delicious flat bread can be baked in a shallow pan, which will yield a little more height, more interior crumb for dipping in EVOO. It can also be baked free form, directly on baking stone– it may not be as tall as ones baked in a pan, but more crusty for sure. Well, how to have the best of both worlds? The magic is baking in a pan, AND in a high temperature oven (425°F–450°F, preheated at least 20 minutes), use baking stone (for even heat distributing) and water sprays (to create a baking environment similar to brick oven, producing crunchy crust). My focaccia this time turned out awesome. 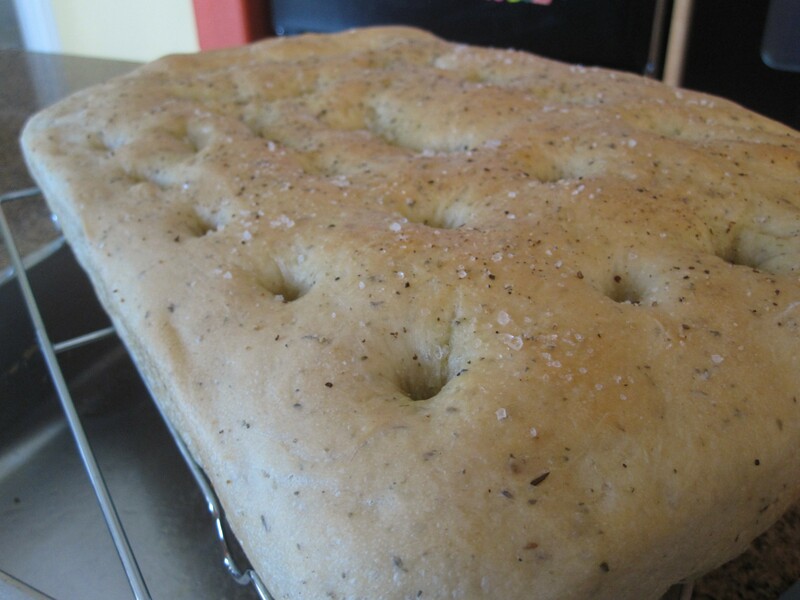 I think it was the best focaccia I’ve ever had (including store bought and restaurants)~ crusty with every bite, yet the interior crumb is very soft and fluffy for dipping in extra virgin olive oil, not to mention the wonderful aroma from the herbs. I used Zojirushi bread maker to knead the dough as my KitchenAid stand mixer was dying on me. This is a relatively easy recipe because the ingredients are simple and the machine does all the hard work. It’s so easy that I think I will have my kids made the bread next time. Add water and olive oil at the bottom of breadmaker loaf pan. Then add bread flour, covering the liquid. Make a indentation in the center and add yeast to the ndentation. Put salt and Italian seasoning mix at different corner. Select “DOUGH” course and press “START”. When the course finishes all cycles, remove dough to a greased large bowl. Cover bowl and rest in a warm place until the dough doubles in size. Meanwhile grease a 9″x13″ shallow pan with 1 tbsp olive oil. Remove dough from the bowl to a lightly floured surface. Punch down the dough and stretch out slightly. Transfer to greased baking pan, stretch out the dough with fingers to cover the bottom of the pan. Cover pan with plastic wrap, rest in a warm place until the dough doubles the height. Preheat oven to 425°F (at least 20 minutes) with baking stone positioned on upper 1/3 rack. Fill a spray bottle with some water. Drizzle 2 tbsp olive oil on top of the bread, then make dimples, 2 inches apart, with your finger. Sprinkle some ground black pepper and kosher salt on top. Quickly spray water to oven walls, about 2-3 spray per side. Do it quick before the oven loses its heat. Place baking pan and dough on baking stone. Bake for 15-18 minutes, until the top is golden and crusty. 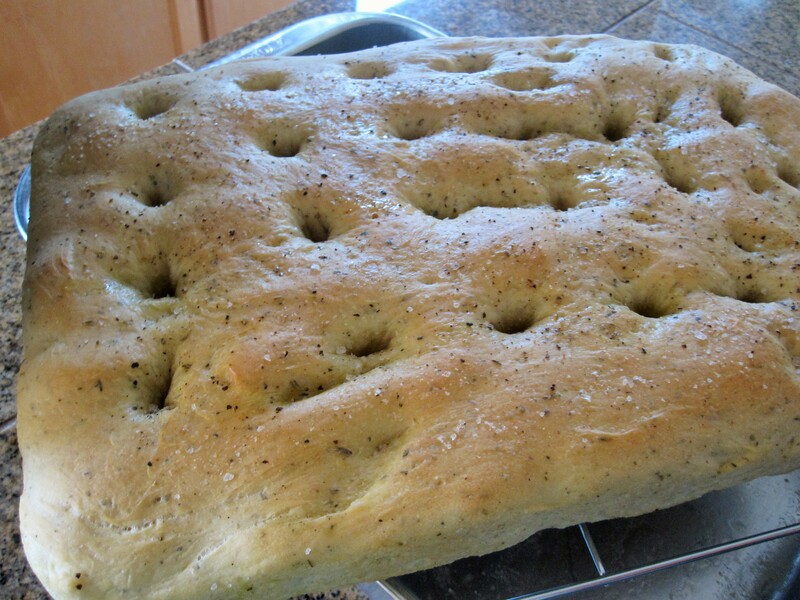 Remove focaccia from the pan and cool on a rack. Dough rise: after Zojirushi finishes its dough course (including rise cycles), I took the dough out and rest dough in a bowl until it doubles in size. 2nd rest in greased baking pan is double in height– it takes a longer time but I think it makes very soft fluffy interior crumb. Leftover focaccia can be frozen. Just wrap up tightly and placed inside an air-tight ziplock bag. When ready to serve, thaw in fridge slowly then fresh it up in the oven. As my KitchenAid stand mixer recently dying on me on bread dough kneading, my hubby got me this bread machine for me this past Christmas. Oh how very sweet of him!! Back then when I decided to buy a stand mixer instead of a bread machine because I thought stand mixer is more versatile– it can handle mixing, whipping and dough kneading. Bread machine is only for making bread (not to mention its big bulky size)… well, now I change my thinking– bread machine is called “bread machine” for a reason~ I have tried bread from a bread machine vs. stand mixer. And let me tell you that bread from bread machine has a softer texture. The other thing is, at least I don’t have to worry about the weird sound coming from the stand mixer while kneading the dough, nor do I have to worry the burning smell (and little smoke coming out of the accessory attachment hole!) from the overheated motor. Yes, it’s bulky, but it’s much much lighter my Kitchen Aid stand mixer, and much much quieter! I am now worry free when I make breads~ I can do other chores without checking on it every now and then, take long showers, go shopping… okay, enough talking here. Time to get to work! Combine bread flour, milk powder, sugar and salt. Add water and beaten egg to the bottom of bread machine loaf pan. Carefully add in flour mixture (to cover the liquid in the loaf pan). Make a small well/ indentation on top of flour mixture, add dry yeast to the indentation. Scatter butter pieces around the yeast. Select course to “REGULAR/DOUGH” and press “START”. Meanwhile, blanch hot dogs in boiling water for a few minutes to wash down the salt. Drain and pat dry. Cut hot dogs in half across the length to make 16 pieces. Cool completely. When machine finishes kneading the dough, remove dough from machine loaf pan and place in a large bowl. Cover with plastic wrap and rest on a warm surface (I used double-boiler method– place bowl on top of a slightly small pot filled with hot water at the bottom, rest the pot on a kitchen towel on the table) for 30-45 minutes. Divide dough into 16 portions, pull each portion to 12 inches long sticks (like making bread sticks). 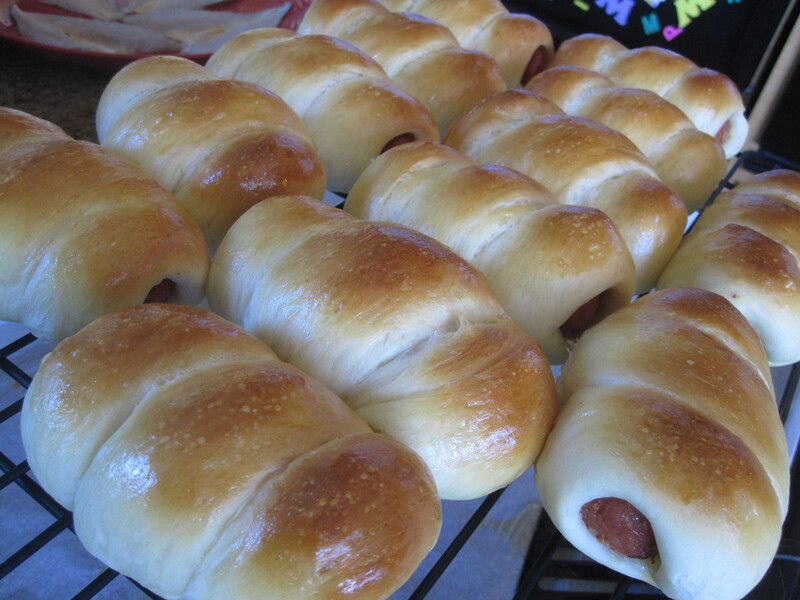 Wrap the dough around 1 hot dog pieces, pinching both ends to seal tightly. Place on baking pan with sealed side facing down. Repeat with remaining dough and hot dogs. Cover the hot dog buns with plastic wrap. Let hot dog buns rest in a warm place until it doubles in size. Alternatively, you can also let the buns rise slowly in the fridge overnight, bring to room temperature the next day before baking. 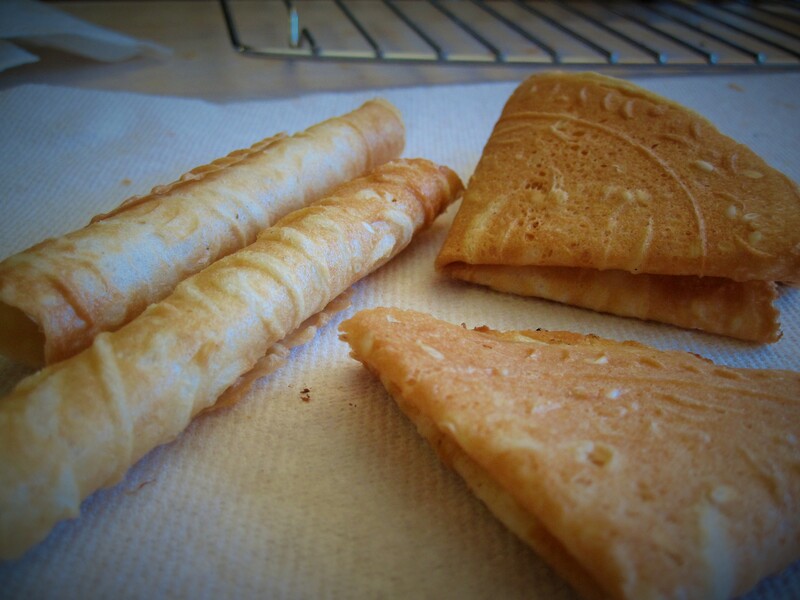 Apply egg wash and bake at preheated 350°F oven for 15-18 minutes or until the top is golden brown. Sift rice flour, flour and tapioca starch in a large bowl. Add coconut milk and mix well to combine. In a separate bowl, beat eggs and sugar until sugar dissolves, about 5 minutes. Add to the flour/coconut milk mixture. Blend well. Strain the batter to remove any lumps. Mix in sesame seeds. Preheat traditional love letter mold over gas stove on high heat for a few minutes. 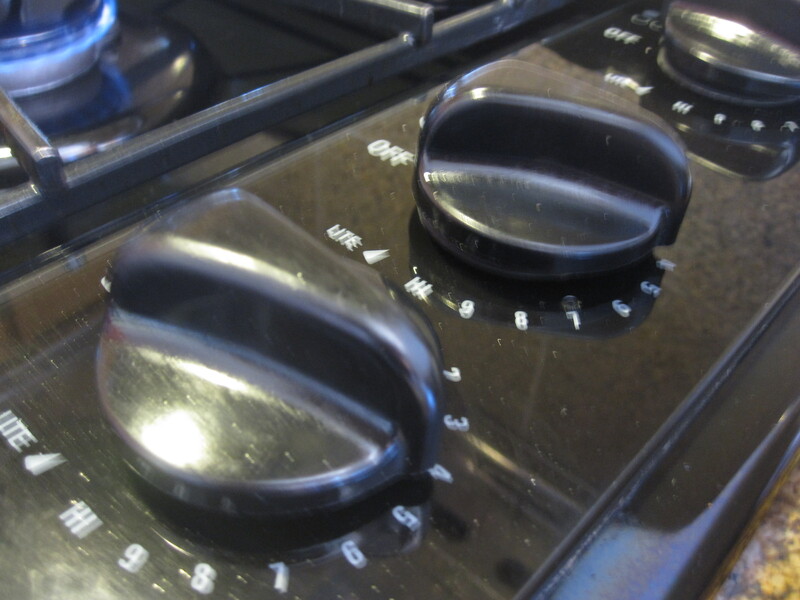 Then turn heat down to medium low (mark 4-5 on my stove). Brush the mold plates with a little oil. Spoon 1 tbsp of batter to the center of the mold and quickly swirl around with the back of a spoon. Carefully close and lock the mold. Cook on the stove until it is golden brown, about 1 minute per side. 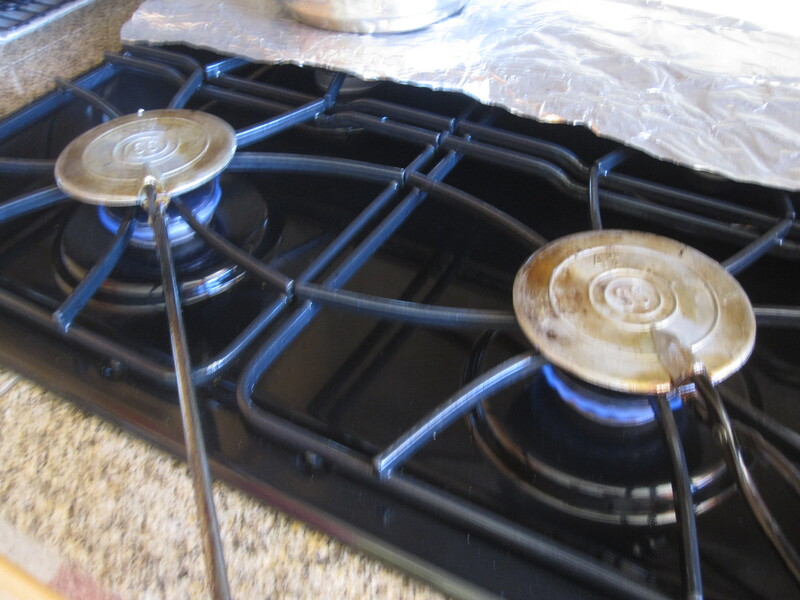 Each stove is different so you have to experiment the first few love letters to adjust the stove heat. Remove from the mold plate with a small knife. Then quickly roll up love letters or fold it in quarters. This has to be done fast while it it still hot as it will harden and turn crispy very quickly (and this is why I folded instead of rolling up). Cool completely before storing in air tight container. Be sure the mold is preheated well or the love letters may stick onto the mold. Stir the batter each time before pouring it onto the mold plate. After adding batter to the mold plate, pay attention when closing and locking the mold– my experience is that if I close it too fast, the fast closing action will create a gasp of air that will squeeze out batter through the tiny gap between the two mold plates. If I close the mold a bit slowly then its not as bad. This is also why i don’t swirl the batter to the edge, giving it some room just in case the batter got squeezed out a little. Use a small knife to scrap off any leaked batter around the outside of the mold. If using two molds at the same time, pay close attention to the timing of each mold while cooking. When love letters starts browsing, they get very brown fast. These are traditional love letter molds that I used. I did it over my gas stove. Reminder to self: stove heat is between mark 4-5.